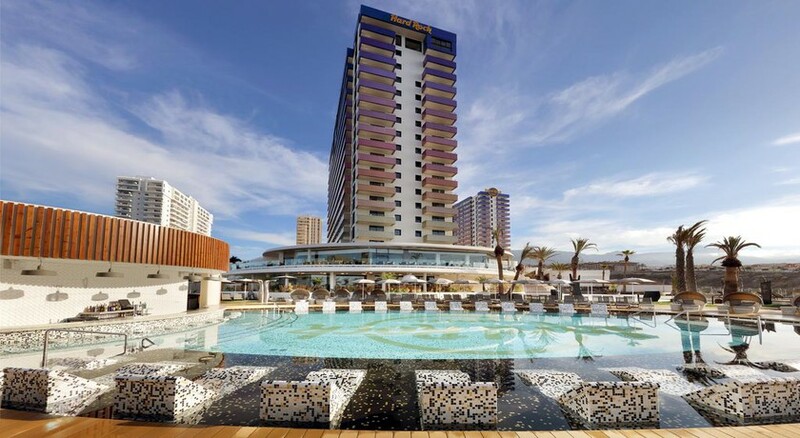 The Hard Rock Hotel Tenerife is situated in one of the most fascinating and beautiful destinations in the world – Tenerife. This recently renovated hotel is strategically set near Africa’s north western coast in the Atlantic Ocean. This unique beach-front resort comprises three glittering swimming pools. 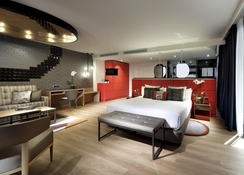 Guestrooms of the hotel are truly amazing and are sure to make to feel like a rock star! This ultimately makes the Hard Rock Hotel Tenerife the coolest establishment in Tenerife. The hotel comprises a high-tech convention centre for events and meetings, it has a capacity to host up to 700 people. 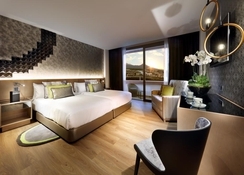 It also features an exceptional dining, recreation and entertainment facilities. 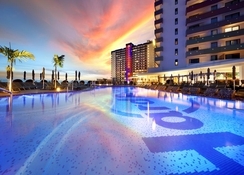 The Hard Rock Hotel Tenerife enjoys a fabulous location near the north western sea shore of Africa. 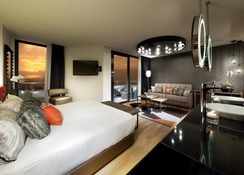 What’s more is that the hotel is located near Mount Teide, which is not only the highest mountain in Spain, but also the third largest volcano in the world. It is about 64 km from the hotel. 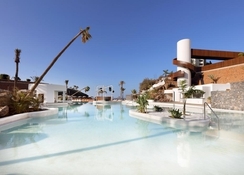 Apart from this, the hotel enjoys close proximity to several places of interest such as water parks including Los Roques De Garcia, Siam Park, Drago Tree, Aqua Land Costa Adeje, Masca Valley, Pyramids of Guimar, Jardin Botanico, Loro Parque and Cetaceans Watching. The Tenerife South Airport is 26km from the hotel, making it convenient for the guests to board their flights on time. All the suites in the hotel offer a true VIP experience. Most of the suites offer extraordinary sea and mountain views, making your stay one memorable. The suites are available in following categories: Rock Royalty Deluxe, Rock Royalty Studio Suite, Rock Royalty Suite and Rock Star Suite. All guestrooms have the necessary amenities that include flat screen TV, air conditioning, glass terrace, coffee maker, maxi bar and wine selection (with an additional fee) exclusive robe, free Wi-Fi and computer access, in-room service and much more. Whether you want to have a bite in the hotel or discover the island’s local eateries, Hard Rock Tenerife is the perfect destination for you. The hotel’s ten restaurants and bars serve a variety of cuisines from around the world. You get to choose from Montauk, The Beach Club, Narumi, Aliole, Sessions, 3rd Half, UTC, The 16th, Nirvana & Oasis Pool Bars and Constant Grind Coffee Shop.MP includes 1 drink per dinner per pax. When it comes to sports, leisure and entertainment, the hotel is one of the best in Spain. Take a lap in one of the three swimming pool and maintain your exercise routine at the hotel’s Body Rock fitness centre. The hotel maintains high-tech equipment’s in its fitness centre and also offers fitness classes. Whether, you like soft white sand or volcanic black sand you will find them all at the beaches close to the hotel. For the perfect unwind after a tiring day at the volcano, head over to the spa that offers soothing massages and beauty treatments. The new calendar of the Children's of the 80th party at our Hard Rock Tenerife hotel. The access to the party is free for guests staying. Please note : The published rates for stays on 31 December include a mandatory New Year party held on that evening. Only half board rates include New year buffet dinner for 31th of December. 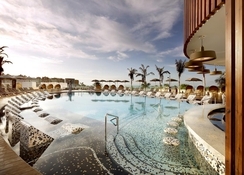 We hereby informed that, from the 3 existing pools on the Hard Rock Hotel Tenerife the Eden one is exclusive for Adults.